Working out in the elements can be tough and unpredictable. 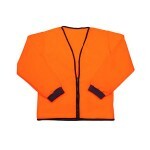 A long sleeve safety vest is the perfect companion to carry in your bag or ute with you. Just slip it on over your clothes when the weather gets rough, and you’ll stay warm and dry as well as being visible on site. Made from tough, durable material, in a huge range of fluro colours and styles, you’ll find the right safety vest here. Our entire range of vests are available online, in generous sizes from XS-10XL, as well as the option of bright 50mm tape in a number of styles. All of our safety vests are designed to meet or exceed AS/NZ Standards and manufactured to order right here in Australia. Buy online and save! With our super fast shipping, you’ll have your custom long sleeved safety vest delivered right to your door before you know it! Long Sleeve Hi Vis Vest When the weather is tough and you’re working outside, you need something with a bit more protection than your standard safety vest. 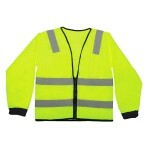 Our long sleeve hi vis vest will keep you ..
Reflective Long Sleeve Hi Vis Vest Whether you’re working outside in the cold or rough weather, or inside a breezy factory, our reflective long sleeve hi vis vest will keep you safe and visibl..